All you military spouses are nodding your heads right now. Home is where the Navy sends us. Truer words were never spoken. When we first began this military journey 2.5 years ago, I didn't believe that anywhere other than Texas would ever be home. 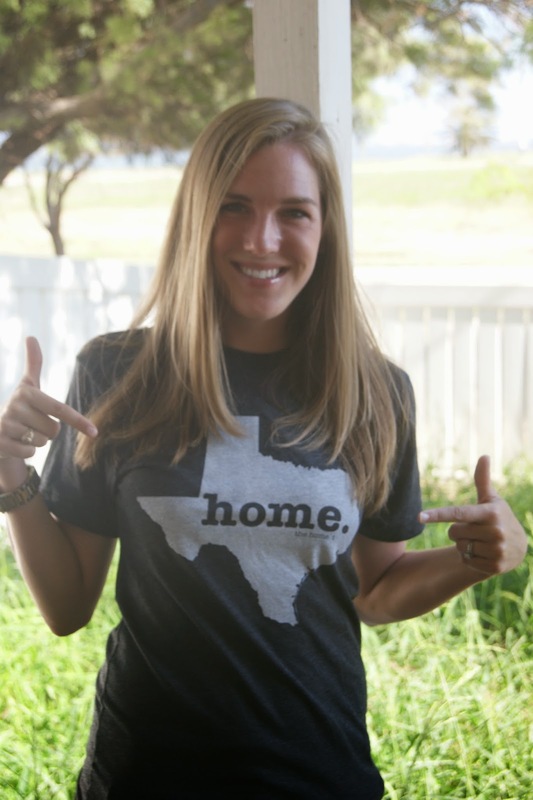 Texas is all we knew, and I couldn't imagine ever loving anywhere as much as we love our home state. To a degree, I was right. Texas still is home, and it always will be. When Parker and I talk about "going home", Texas will always be it. 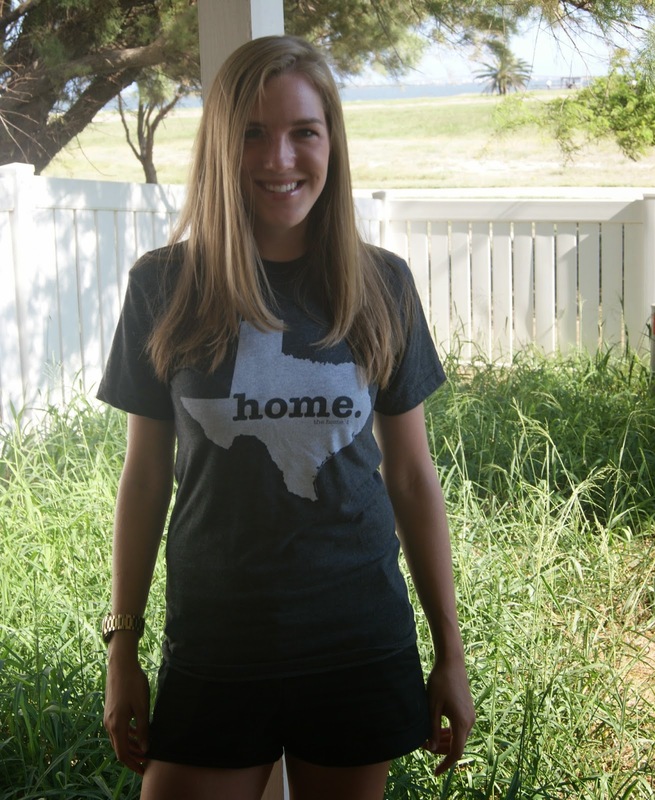 The majority of our family is in Texas, and to me, home is where your family is. I know there are so many other wonderful places in the world besides Texas though, and I don't want to be old and gray and not have visited any of them. Thanks to the Navy, we are adding quite a few stars to our world map and experiencing places we otherwise probably wouldn't. Getting to come back to Texas for a year has been a gift. It will probably be a while before we are back here for good, but it was fun while it lasted! I'll be taking my new favorite shirt with me to VA and wearing it proudly. Gotta represent the homeland! I was also very wrong about believing nowhere else could ever be home. Each place we have been has felt abundantly like home. Pensacola became home to us. Kingsville became home to us. Even Corpus Christi has become home, and we lived here just 3.5 short months. Norfolk will be home too. Home for me is where my little family is. As long as I have Parker and the Jen pup, I'm home. Here's to the next chapter in our story! I know it will be full of ups and downs and plenty of adventure. There is never a dull moment with these two around. Our little sign is getting longer! Can't wait to see what this thing looks like 20 years from now! this is so cute! I love the little sign to remember all the places. I've been wanting to do something like this, too! We move a lot, not due to Navy status, just because hahha. What a cute idea! It will be interesting to see how many different locations will get added. 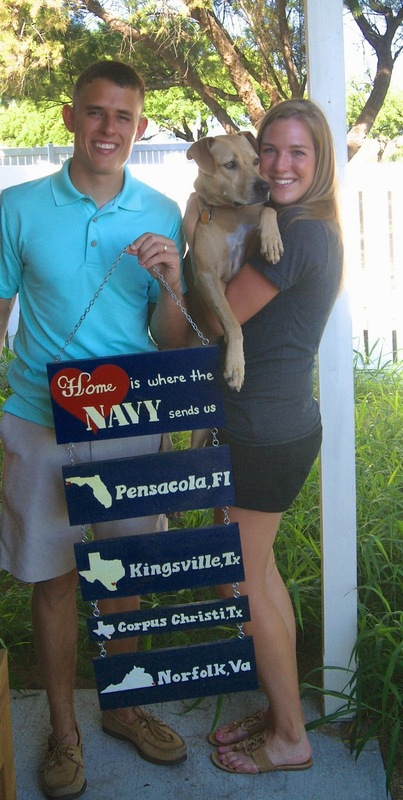 My best friends husband is in the navy, and in the past year she has been re-stationed 3 times. I love that sign! 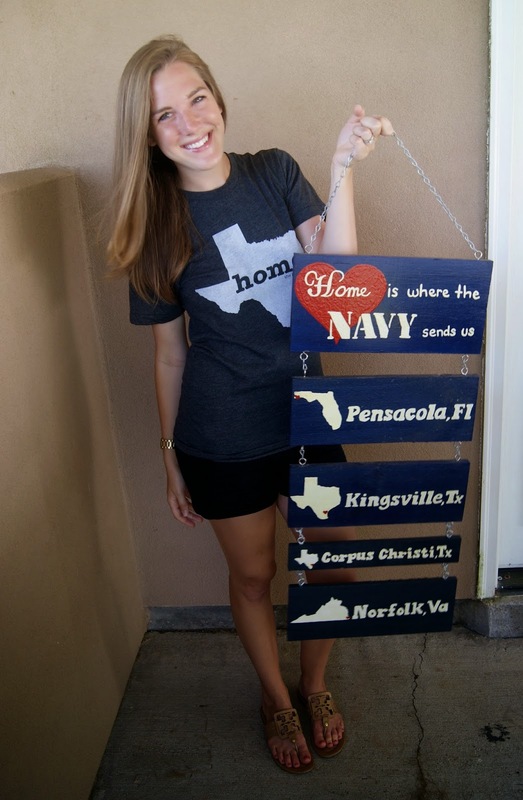 What a fun way to document all of the places you've called home! I love the sign! I can't wait to make one for John and I! love the sign. where do you put though when it gets that long. Such a sweet sign! Hopefully one day the Navy sends you to California! Love that sign--what a cute idea! What a cute idea!! love it!! where did you get it? I love your shirt (and the sign!) I want a Home shirt for KY but it would look weird since I still live here. So cute! I have seen these before and I so need to make one of them! I love your shirt, I love that sign and I love this post! Your so right, anywhere can be home if you have those you love with you. i am in LOVE with y'alls sign. if you ever get stationed near charleston, sc me & you are hanging out girl! HANGING OUT!!! !